Alright, you’re a printer. You have customers that have to come to you for decades to solve that one need – “print for me”! Perhaps “print” is even somewhere in your company name. However, you are paying attention, and you know that the worlds of marketing and communication have evolved greatly, and continue to move. You’ve invested in software, hardware and other resources to help you provide solutions that touch channels other than print. Yes, you have the capability to provide multi-channel marketing solutions. However, your prospects and customers don’t quite realize that yet. Or maybe they don’t believe it. If you want to change the perception that all you do is print, here’s one idea: Throw a Party. 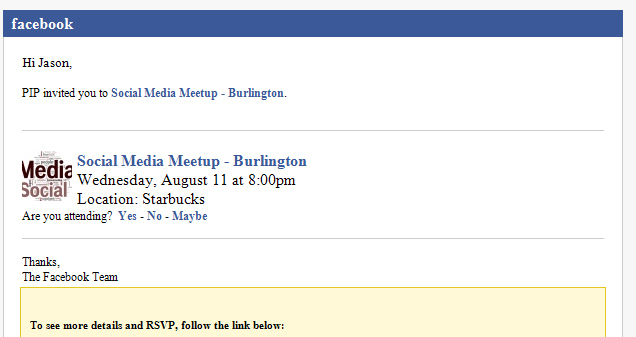 Notice that the theme of the event was “Social Media Meetup”. If you were a long-time customer of this business (in this case, a PIP Printing), that theme may certainly cause you to pay more than the usual attention to the invitation. Here is a printer that is throwing a party that’s based on a marketing channel other than print. No doubt this would cause you to at least start to think of the printer in a different light. Perhaps you may become inspired to call them to find out more about what they are doing… or maybe you even (oh my gosh!) attend the meet-up. Perceptions and reputations can do a lot of good for us at certain times. But in a world that’s always moving and changing, we all face situations where we need to “shake” how people think of us. A little party here or there may help to get the shaking going.